Is history important? Is it worth using limited resources to preserve? Does anybody really care that much about history? Are traditions worth continuing? I’d turn those questions around and ask a different question. What is the glue that holds all of us together as initiates of Sigma Nu and how can we strengthen that bond? What connects us – whether I’m from a large chapter and you’re from a small one? Whether my chapter is over a hundred years old and yours is less than five? Whether I was initiated 50 years ago and you were initiated last week? Whether I attended a public school and you a private one – whether in Canada or the United States? One of the many historical items received at the General Fraternity office. successful organizations at building camaraderie and loyalty among its members is the United States Marine Corps. Once you’re a Marine, you’re always a Marine. You don’t lose pride in the organization or your fellow Marines once you have it. What can Sigma Nu as an organization learn from this? The study concluded that Marine’s focus on Corps history, traditions and heroes created loyalty and pride. Every year, on November 10th, the Marine Corps hold a Birthday Ball to celebrate their founding over 238 years ago and their connection and pride in the Corps. At these formal balls, a birthday cake is cut and the first and second slices are presented to the oldest and youngest Marines in attendance. The Marines Hymn is the oldest official song in the armed forces. The Marine Corps band is the oldest continuously active professional music organization in the United States and has played at the inauguration of every president except those of the first two, George Washington and John Adams. The Corps teaches history as a part of basic training and holds up those fearless men who epitomize courage and leadership. A Marine leader leaves no man wounded or dead on the battlefield and also ensures his men are comfortably fed, clothed and housed. In fact, in the field an officer lines up after his men in the mess lines to be certain all his men are fed. Emphasis on history, tradition and heroes plays an important role in creating the Marine Corps’ esprit de corps. So, can Sigma Nu as an organization learn from the example of the US Marines? While our founding was more recent than 238 years ago, in the years since our founding in 1869, we have developed a rich history of our own. While our traditions don’t involve carrying a rifle or sending men into battle, they are shared by over 230,000 men in over 279 active and dormant chapters. While many of our heroes don’t wear uniforms, they still inspire us with examples of Love, Truth and Honor. Thus, with this edition of The Delta, I’d like to launch a Heritage Initiative with the idea of preserving and promoting our history, traditions and heroes. Let me share with you some thoughts and ideas, as well as actions that have already taken place along those lines. Last year, I attended a conference for fraternity and sorority historians and archivists held at the University of Illinois. In addition to participants from traditional fraternities and sororities, there were others representing cultural-based fraternities and sororities that have sprung up in recent decades. Many of us envied these newer organizations because their founders and early members were still alive and available to be interviewed and questioned about their motivations and struggles in founding a new organization. We encouraged them to take advantage of this opportunity to capture their early members on video and audio tape to ensure it is preserved for future generations. Can you imagine if the technology had been around when Sigma Nu’s founders were still alive, how much more we would know about the founding of the Legion of Honor and its early history? Fortunately for many of our Sigma Nu chapters, particularly those in the Zeta series forward, the opportunity to preserve the memories of your founders still exists. Find and take the time to interview these men while they’re still around and make sure it’s done in a way that will be preserved for the future. Videotape them, audiotape them and get them to write down their memories while you can and send copies to the Sigma Nu archives in Lexington for preservation purposes. Let me share with you two different examples of early chapter history’s that were published just last year. My own chapter at San Diego State University celebrated its 50th anniversary in February 2013. As part of the celebration, Jeff Giardi (Eta Kappa #1) spent the last five years researching and writing about the first 10 years of the chapter and its predecessor local fraternity. Over that time, he solicited thoughts and remembrances from early initiates of the chapter. After countless hours of interviewing, researching, writing and editing, he produced a 785 page history of those early days. Copies of his two-volume set are now housed in the Richard R. Fletcher Honor Library in Lexington as well as the Sigma Nu archives for future researchers. While I’m not suggesting every chapter history needs to take five years or expand over 700+ pages, the key is that the process begins somewhere, even if it’s just recording the early memories of your chapter before it’s too late. 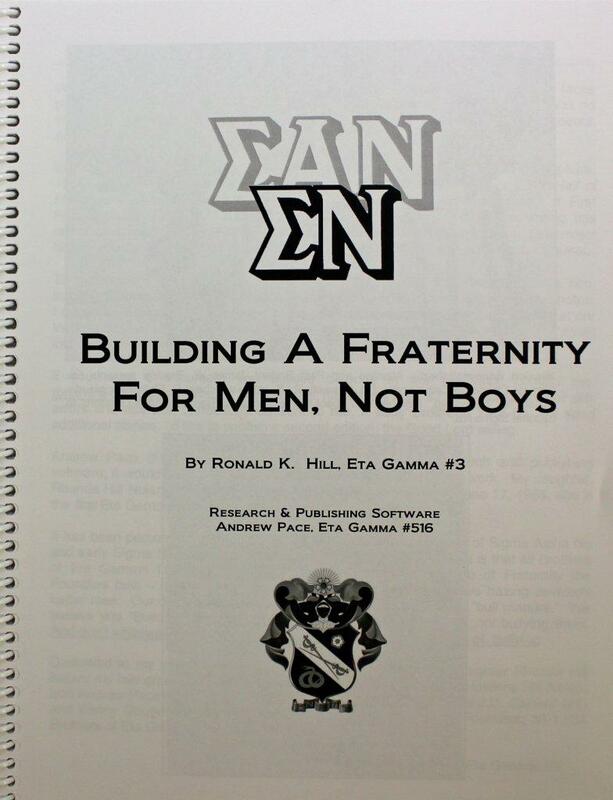 The second example was written about the early days of our Georgia State University chapter and its predecessor local by Ron Hill (Eta Gamma #3). Ron’s history, totaling 80 pages, takes a very different approach as outlined in his forward. Although based largely on his own memories, this history is no less fascinating and informative about the chapters early days and its members. I cite these chapter histories as two excellent examples of what can be done to capture and preserve the early history of your own chapter. While I know every Grand Historian before me, since Isaac P. Robinson in 1884, has preached a similar message, every day that passes means the further loss of memories and those who lived them. If you are interested in purchasing a copy of either book, please send me an email at news@sigmanu.org. In addition to encouraging the collection and writing of chapter histories, I ask those of you who have Sigma Nu photographs, documents, composites and other memorabilia to help build our historical collection in Lexington by donating these items to the fraternity. Part of our long-term Heritage Initiative is to construct a facility that will house these items in a temperature and humidity controlled environment with easy access for our members and researchers. A collection of White Rose songs. items related to Sigma Nu and their chapter to the Sigma Nu museum/archives. I’ll share with you examples of items we’ve recently received that are wonderful additions to the collection. The first is a series of magazines, The Dahlonega Transcript, that John Alexander Howard (first editor of The Delta) edited and published in the early 1900’s. The magazines were produced for Georgia area alumni of Sigma Nu and focused on local chapters, happenings and alumni. His great granddaughter, Gail Fishman, was kind enough to donate them to us. James Hamilton, a member of Phi Gamma Delta fraternity, donated the second item. 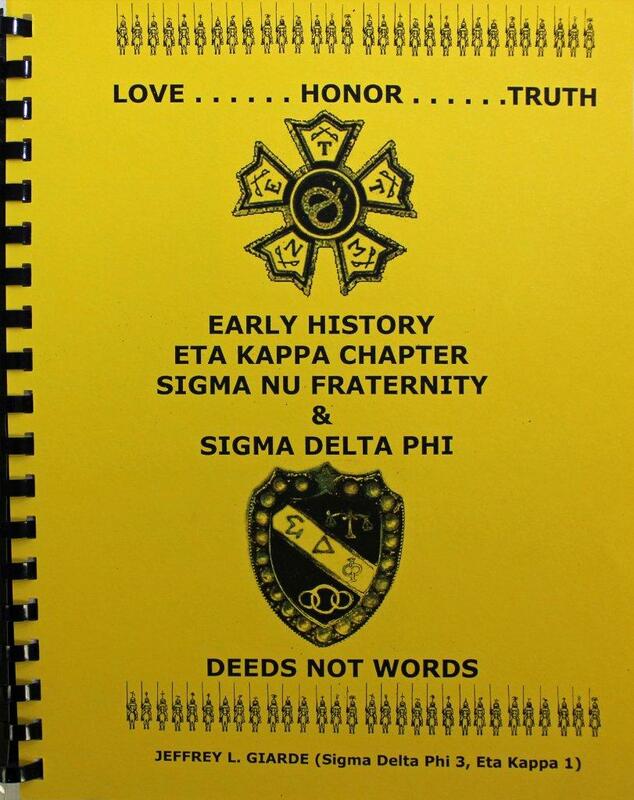 The book is an early minute book (1917- 1920) from our Beta Nu Chapter at Ohio State University. John’s brother was a Sigma Nu at Northwestern and somehow ended up with the book in his possession at his death last year. What a treasure to have for anyone interested in the early days of this chapter! Recently, Gerry Likness (South Dakota State) asked about the history of the White Rose formals that many of our chapters host each year. Of course, I knew they were named for the official flower of Sigma Nu, but I wasn’t sure how or when the tradition actually began. After researching in The Delta, here’s what I found. 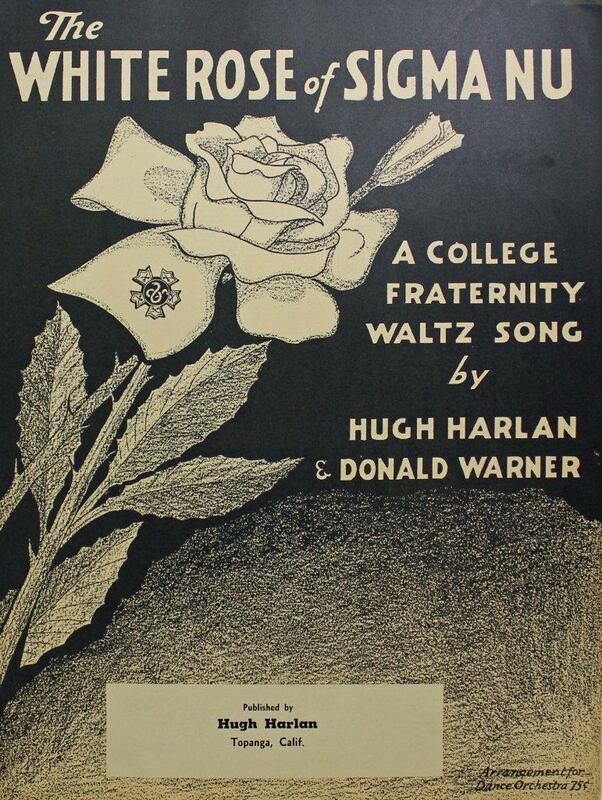 In 1934, Hugh V. Harlan of our Nebraska chapter wrote a song titled “The White Rose of Sigma Nu”. It appears to have been first sung jointly by our chapters at UCLA and USC on October 6, 1934 at the Biltmore Hotel in Los Angeles. In the May 1935 edition of The Delta, the University of Idaho chapter reported they held their first White Rose formal in December, 1934. It was to be given yearly in December for the upperclassmen of the house. The article indicates the entire theme was built around Sigma Nu’s new song, and a white rose was handed out to each member. This is the first mention I can find of a chapter holding a White Rose formal dinner-dance. Subsequent to that, many chapters started using the White Rose theme for their formals. Early mentions are of the chapters at Kansas State, the University of Arizona and Texas. Many of us have been to a White Rose formal and have fond memories of the evening. This is an example of one of the many Sigma Nu traditions that bind us together. Ritual is also an important tradition. Founder James Frank Hopkins wrote the first one. Despite modifications over the years, our ritual today still contains most of his original work. As an organization, we have many traditions including the values contained in The Creed – Love, Truth and Honor, the symbolism behind the badge worn by all of us and the history of our founding at VMI. Traditions provide continuity from generation to generation and are important parts of the structure that holds organizations together. Although traditions change and evolve over time, they bridge the past, the present and the future. My two most recent columns in The Delta focused on three of our many Sigma Nu heroes. The summer 2013 edition spotlighted Ray Ewry (Purdue), arguably the greatest Olympian ever and a member of our Hall of Fame. The fall 2013 edition focused on the valor of our two Medal of Honor winners – Christian Schilt (Rose-Hulman) and Nathan Gordon (Arkansas). We honor many of our heroes through their induction into our national Hall of Fame and Hall of Honor. In addition, many chapters have their own Hall to remember their outstanding initiates. In the fall issue of The Delta, I discussed an effort currently underway to identify all initiates who served in the military during one of our wars and made the ultimate sacrifice by dying to protect our freedoms. Their names will be added to the Flag Pavilion at our headquarters in Lexington to appropriately honor and remember them for their courage and sacrifice. To make sure they are all recognized, I asked our readers to send in the names of those they are aware of who died. Listed below, are the names of those brothers we have identified who were killed in the Korean War. In future editions of The Delta, we will list the names of those who died in other wars. Please let us know if we’ve missed anyone who should be included on this list by sending an email to news@sigmanu.org. We are currently cataloging, photographing and rehousing our historical collection in Lexington. There are thousands of documents, photographs, audio tapes and other memorabilia that need to be processed and digitized so they can be made available to our chapters and alumni. To assist in this process, we will conduct our first annual volunteer weekend on June 6-8, 2014 in Lexington. The goal is to get a small number of volunteers to spend a full two days working in the archives on various projects. Due to budget constraints we are unable to pay the costs of transportation and housing for volunteers, but we will provide the meals. If you’re interested in helping out, please send me an email at news@SigmaNu.org indicating your interest. If successful, we hope this will become an annual event. All of this leads to a very important anniversary: Sigma Nu’s 150th Anniversary in five years – in 2019. Plans are currently being discussed and put into motion for a spectacular series of events and projects that will take place as part of our sesquicentennial. Our history, traditions and heroes will play a major role in this celebration. Grand Historian McCulley has done a great job with this topic as he always does, and it was a great speech by Regent Durham, as available here: http://www.youtube.com/watch?v=iKbU7PAOlbU.